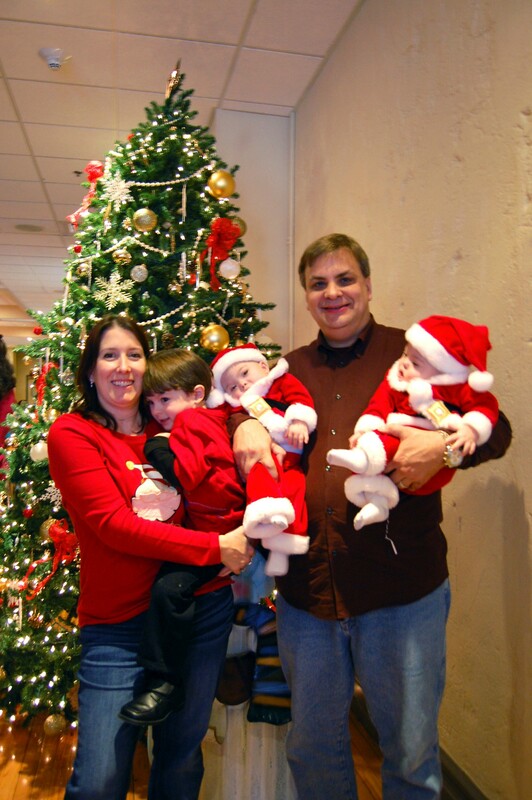 Mary Waksmunski holds 3-year-old son Jesse while husband Eric holds 9-month-old twins Shane and Wyatt in front of the Christmas tree in the Hamilton room at the Allentown Brew Works, Allentown. Despite a difficult week, 9-month-old twins Shane and Wyatt Waksmunski with their parents Eric and Mary and 3-year-old brother Jesse traveled from their home in Mahoning Township Saturday to join other families at the Eastern Pa. Down Syndrome Center’s annual Holiday party. The event was held in the Hamilton room at the Allentown Brew Works, Allentown. The restaurant donated use of the room to EPDSC. About 170 people were in attendance. 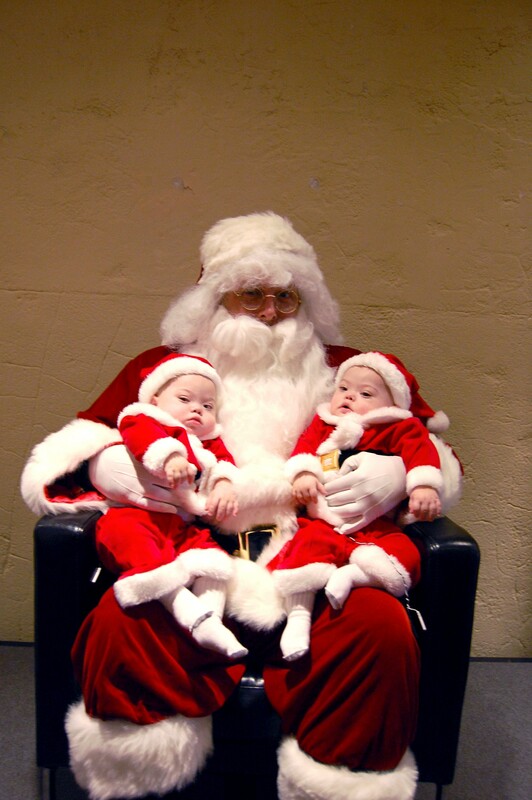 Dressed in matching Santa suits, the twins mesmerized those in attendance with their charm. After a buffet-style breakfast was served and family photos were taken, Shane and Wyatt posed for photos on Santa’s lap. Fun was had by all at the party and each child got a chance to visit with the jolly old man in red and receive a present. “We really enjoyed going,” said Eric Waksmunski. “We got to meet with some of the other families, and it was nice to meet the ones from the Buddy Walk. It was really good to see them again. Born in March, the Shane and Wyatt spent their first four months in the hospital. The boys had a couple health scares last week before the party, but by Saturday, everyone was well enough for the trip to Allentown. Who's the real Santa? Dressed in matching Santa suits, Shane and Wyatt Waksmunski sit on Santa's lap for the very first time at the Eastern Pa. Down Syndrome Center's annual Holiday party, which was held this past Saturday. Eric Waksmunski said this was only the third time, other than doctor or hospital visits, the twins have been out to any type of event, other than family gatherings. He said the first time was for the Buddy Walk in September, to raise funds for the EPDSC. Located in Trexlertown, Lehigh County, the EPDSC is a nonprofit organization that provides support to children with Down syndrome and their families in Eastern Pennsylvania. Annual fundraising events include a golf tournament and the Buddy Walk. For more information on EPDSC and its services or to become a member, visit http://www.epdsc.net/, or call (610) 402-0184. The center welcomes donations to aid its mission. Donations can be sent too EPDSC, 6900 Hamilton Blvd., P.O. Box 60, Trexlertown, PA 18087.